On October 2nd, in honor of World Stem Cell Day, NYSCF scientists visited over 200 students at the Harlem Children's Zone's Promise Academies One and Two, introducing students to the fascinating world of scientific, specifically stem cell, research. A group of students from the Promise Academies later toured the NYSCF Laboratory and talked with NYSCF scientists about their cutting-edge research. These were exceptional days and future events already planned at these and many other New York schools. This ongoing educational outreatch program is an exciting NYSCF initiative that seeks to provide educational opportunities for young people and introduce them science and stem cell research. 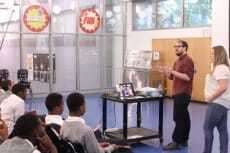 The NYSCF Academy, including these educational outreach programs, is an ongoing education initiative to bring stem cell science education to middle and high school students throughout the greater New York City area in order to promote scientific literacy, educate young people on the promise of stem cell research, and encourage students to study science and technology. The program deploys NYSCF scientists into local schools to provide seminars on stem cell biology and engage students in thoughtful discussion about stem cell research and its promise for the future. Students have the opportunity to meet the scientists and ask questions, both about stem cell research and life as a scientist.